Queenstown Jewellery Shops are definitely worth exploring. Lots of designers live here, so you're guaranteed to find a unique gift, that'll remind you of your visit. Take home some pounamu, the local greenstone for something really authentic. Jewellery Shops in Queenstown will surprise and delight those after something different to remember their trip by. The local greenstone, or pounamu, is unique to this area, so you'll find lots of stores selling necklaces, rings and bracelets which incorporate this beautiful mineral. 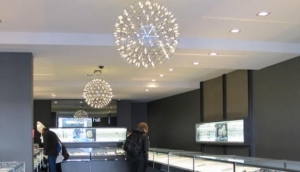 The CBD, around Beach Street and Shotover Street, has some very exclusive jewellery stores, selling everything from solid silver and gold to pearls, Ruby Rock and Jade. Arrowtown is the place to go and browse some local jewellery designers. It's also where you'll find the region's only jade-cutting factory, and a great shop that sells lots of jade and opal-based designs. The gift shops at attractions such as Skyline Gondola will also offer up some weird and wonderful jewellery pieces.